Mini-series such as Skirball Center's V.4 Dance Festival are good for navel-gazing New York dance-goers as they remind us of innovations taking place in dance-theater abroad, specifically Eastern Europe, which we wouldn't likely see in New York otherwise. April 19's program, curated by Laurie Uprichard (ex-director of Danspace Project), led off with Guide, by Czech native Vera Ondrasikova. The first eight rows of house seats were blocked off, presumably so the lasers and fog wouldn't bother audience members as much. The two elements combined to create some mesmerizing effects. 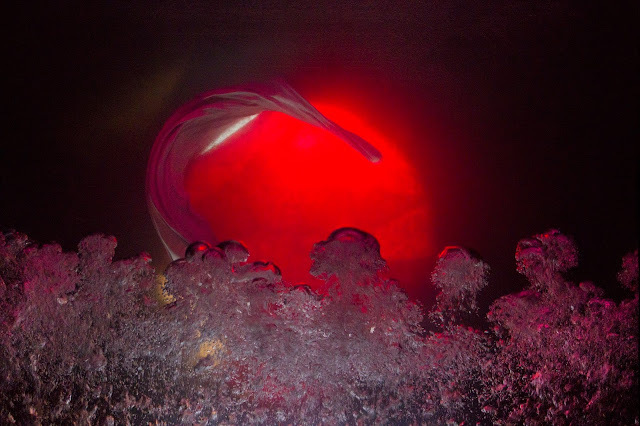 Lighting technology has advanced so that light can be emitted in very precise shapes, and manipulated into planes that undulate, so when the light captures floating fog, it looks eerily like an ocean wave; or the beam can be shaped into a precise box, forming a pyramid around a performer. 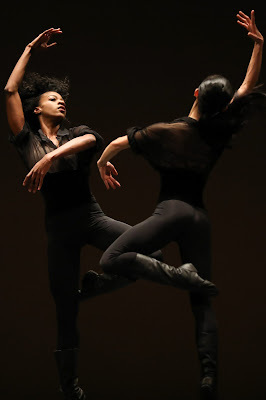 Two dancers, largely seen in silhouette due to the overall darkness, appeared to push the light, and also break the plane. It evoked some sort of sci-fi scenario about passing through a portal into a different realm. The second piece on the program was Pawel Sakowicz's Total, for which the crew laid down white marley during intermission. 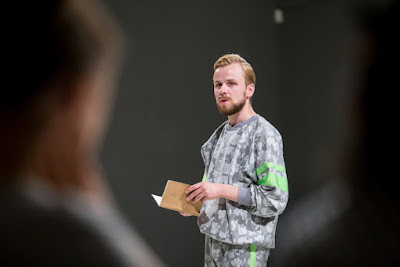 While Guide relied on technological advances to transform the theater, Sakowicz, of Poland, performing solo, simply utilized his moving body, a lecture-like monologue, and a small notebook which he consulted at times. His lecture involved virtuosity and the different ways people value it. The piece consists of four parts, each beginnning with a challengingly cerebral intro, followed by a section of movement. Sakowicz spoke of "eco-virtuosity," and minimizing energy output in a given dance phrase. As he demonstrated, the range of his limbs and amplitude diminished until he was using merely his eyes to suggest direction. 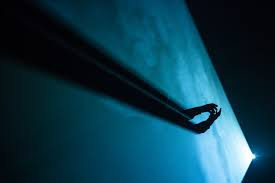 Another topic involved imagining one cell undertaking the basic range of bodily functions, delivered while doing a chain of poses on his knees, accelerating each time through. He polled us to see if we wanted to see him dance his own choreography (we did), which turned out to be a section by Merce Cunningham, most recognizable in bent torso stag leaps. Finally, he said that for himself, there is no virtuosity without an audience present. While I wished he would have danced more, his intellectual musings were certainly thought-provoking and performative in their own right, delivered with wry wit and charm. A second program of V.4 is tonight, including Wow! by Debris Company (Slovakia) and Timothy and the Things: Your Mother at My Door, by Emese Cuhorka and Laszlo Fulop (Hungary). 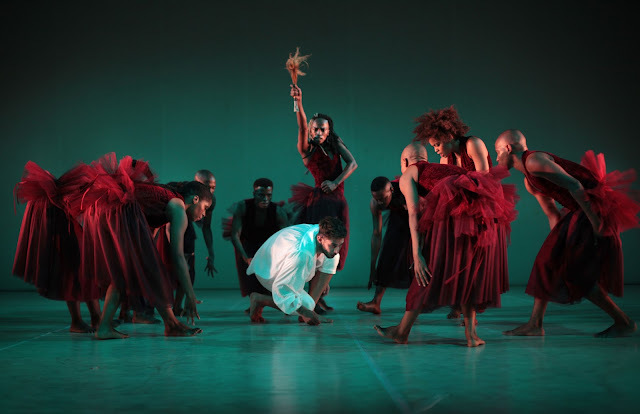 Dada Masilo has come up with a way to make classical ballets relevant and meaningful to audiences who are both interested in the romantic canon, and likewise concerned with contemporary dance and ideas. Her Giselle at the Joyce Theater draws on basic plot elements, characters, and musical themes, but reinterprets the essential story line to hew to a more satisfying, feminist ending in which the guys get their comeuppance. As she did with Swan Lake in 2016, besides tweaking the plot, the dance is freshened in inventive ways. Foremost, the movement mixes snippets of ballet with steps from African and contemporary dance. Each scene's emotional temperature, or message, receives a different treatment of this mixture. So when Bathilde, an aristocrat, moves haughtily through a group of workers, her group's primary language is balletic; the same goes for Albrecht, her two-timing beau. Their costumes made of bright white fabrics and navy brocades. The corps members, comprising the company of 12, wear peasant-style blouses and beige skirts, and when Albrecht poses as a peasant, he slips off his bright white leggings revealing beige ones. While many of the key plot points from the traditional Giselle remain, Masilo pivots in several places. Giselle (Masilo) attracts Albrecht's (Xola Willie) eye; they flirt and dance hungrily, enraging the hapless suitor Hilarion (Tshepo Zasekhaya) who bears flowers for Giselle. The Wilis appear in a prevision; led by a fierce and terrifying Myrtha (Llewellyn Mnguni) as a Sangoma—a traditional healer—bearing a whip, and thrashing his long hair as well. The mixed-gender Wilis, in maroon dresses, evoke bitter vengeance with a more violent intent than the originals, who merely danced men to death. Giselle is humiliated and ostracized— not shown as being mentally and physically weak, as is traditional—but by being stripped nearly naked by her mother in one scene, and later by baring herself before taking the whip to Albrecht. She tries to cover her bare body in shame, but she also uses it as a strength, to show her true state of mind and her pure, strong self. Giselle undoing her hair and flinging it about typically signifies the passage into insanity, but the bald-pated Masilo instead communicates only through her movement (and the occasional vocal exclamation). Traditional African beliefs, embodied in the Wilis, stand in opposition to more Western ideology, represented by Albrecht and Bathilde, in their European-style garb. At one point, Giselle is offered a book—presumably a bible—and rejects it. This tension is parlayed into a debate between preserving South African cultural traditions and adopting Western forms, which Masilo's work deals with. The score, by Philip Miller, combines pulsing percussion overlaid with musical themes from Adolphe Adam's original score for Giselle. Artist William Kentridge created the artwork for the backdrop, a charcoal drawing of a marsh with splashes of color. 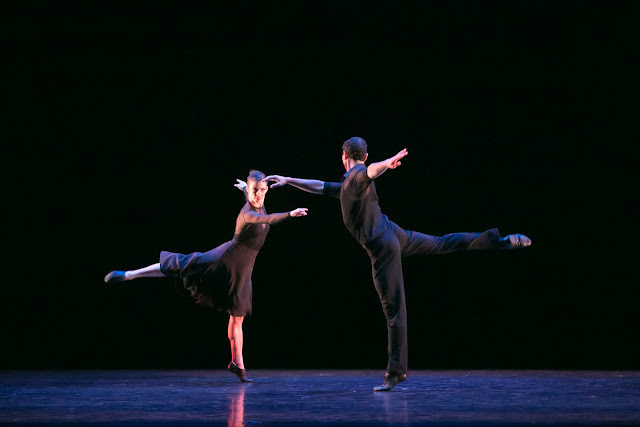 (Masilo choreographed and appeared in Kentridge's Refuse the Hour at BAM in 2015.) Masilo questions and revamps icons of dance while paying homage to them, and greatly expanding potential audiences. Hard to believe it's been two decades since Basil Twist's Symphonie Fantastique took New York by storm, running far longer than thought possible. The production is back at HERE Arts Center, its original venue, presumably freshened with updated technology (well, LED bulbs anyway), but otherwise using the same analog techniques to visually illustrate Berlioz's passionate piano score, played live by Christopher O'Riley. The "puppets" that the performers move through a 1,000 gallon tank range in materials from sequined fabric, glittered circles, tinsel, and bunched fabric, with "screen wipes" made by rising bubbles and cross-swept flags. Drama is created in the musicality, and the shifting lighting adds emotion. O'Riley plunges wholeheartedly into his piano-playing, coming across as a thespian-like character brimming with emotion. The theater remains tiny, and the tank itself is no bigger than a big large-screen tv. They give backstage tours after the show; it's miraculous how tiny the workspace is, and how many dripping wet props hang from every surface. But most incredible is seeing the banal items that come to life when mixed with music, water, and our ability to anthropomorphize sheets and bubbles. Note: Basil Twist's brilliant, tiny puppet person has come to life once again in a retrospective of Jane Comfort's work. Aided by four humans, it stars in Underground River through this weekend at La MaMa.